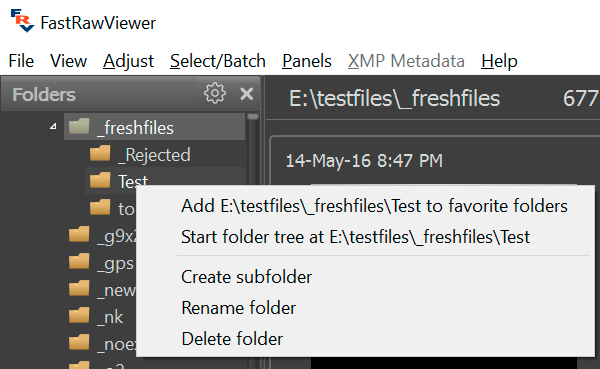 Clicking on the triangle to the left of the folder name opens the subfolder tree. A second click on the triangle closes the subfolder tree. 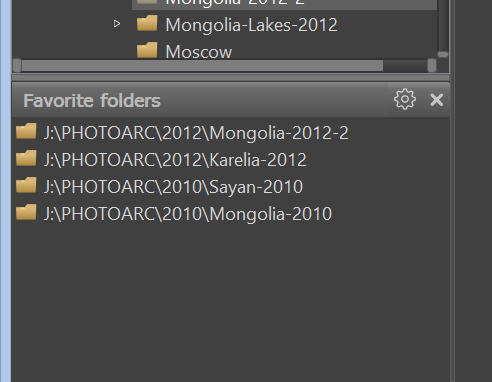 Clicking once on the folder name loads the first preview in the Filmstrip panel. A double-clock on the folder name loads the first preview and opens the first file of the folder in the main program window. The up/down arrows, PgUp/PgDn keys, and Home-End move across the list while loading the previews into the Filmstrip. Enter loads previews and opens the first file in the folder. 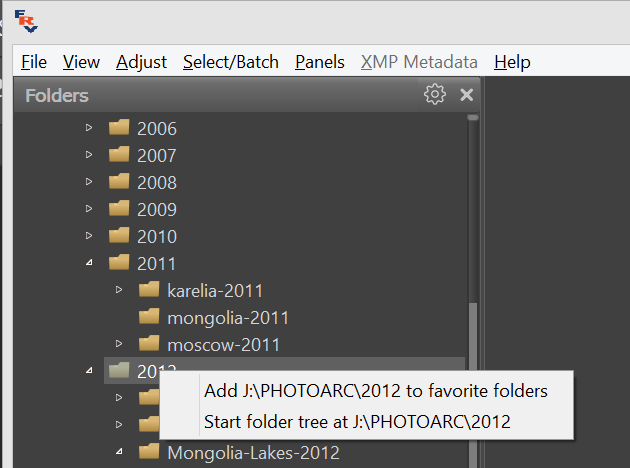 Start Folder tree at current folder (Ctrl-T) – the folder tree will be limited to the current folder and its sub-folders. Start Folder tree at one level up (Ctrl-Shift-T) – the folder tree is limited with the folder one level up and its subfolders (includes the current folder). Move folder filter one level up (Shift-T) – the filtering point is moved to one level up on the folder tree. Reset folder filtering (Alt-T) – resets the filters. [↑] –moves the "root" of the filtration one level up (same way as Move folder filter one level up in menu). 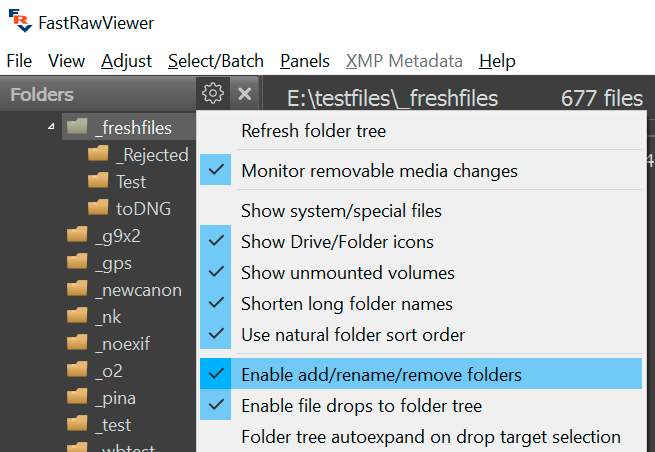 Furthermore, the folder filtration will cease when opening a file or a folder outside of the current tree branch (for example, when opening something through File-Open or by Drag-and-Dropping something into the program window). 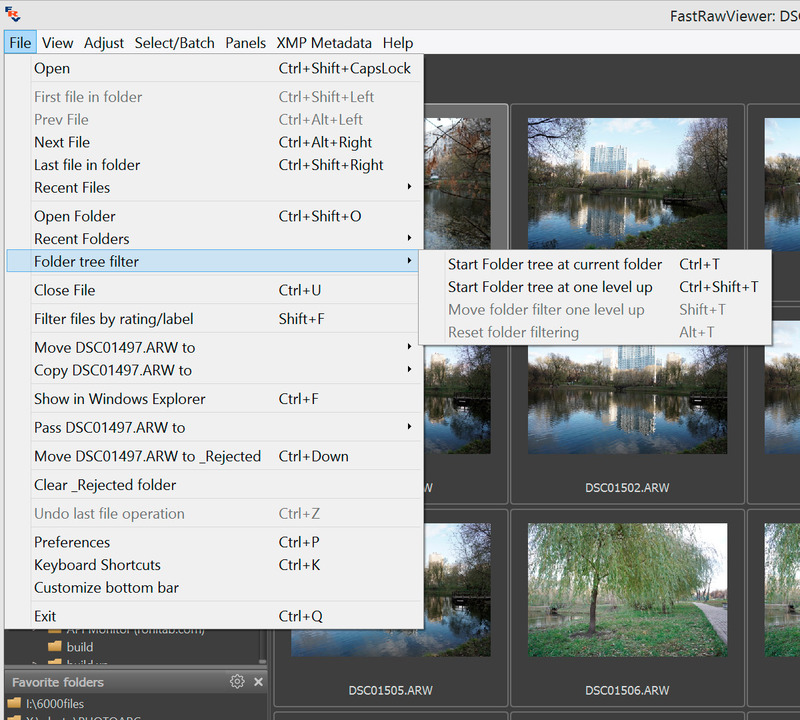 Ctrl+Shift+Left Click – limits the folder tree “by one level above” (same as Ctrl-Shift-T). With default settings, folder filtration is not re-applied when re-launching the program. This can be changed by turning off File Handling – Startup – Reset folder tree filtering on start. “Removable Media insertion detected, FastRawViewer will open the newest folder found on it under the DCIM folder”. Opens the most recent (by date of modification) folder in the predetermined folder. You can also turn off the above-shown warning in the same Preferences section. If the removable media doesn’t use any application except FastRawViewer, then it can be ejected without closing the program. This message means that the removable media is in use by some other program as well, and FastRawViewer cannot safely un-mount it. 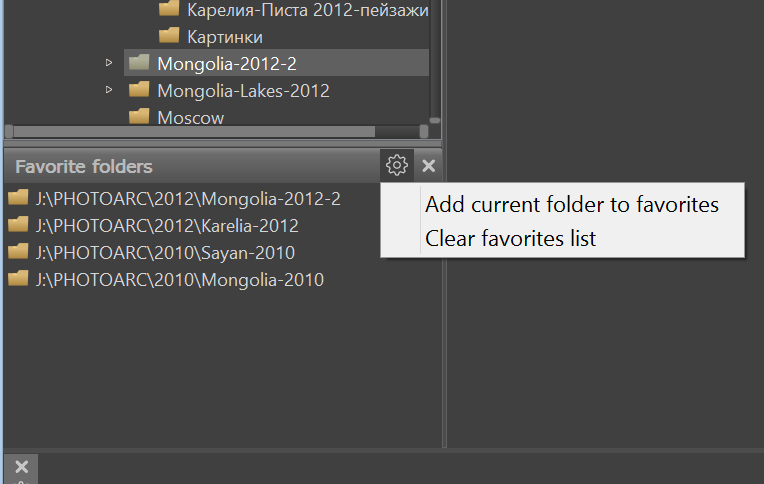 An additional Favorite Folders panel can be found at the bottom of the Folders panel. 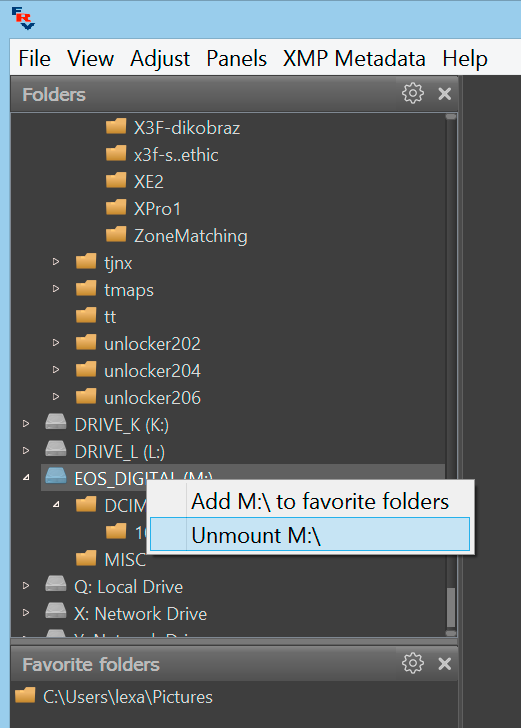 Favorite Folders panel is intended to be used to store a list of select folders in the file system, for easy and fast access. One click: the Thumbnails panel will be populated with the previews of the files in the chosen folder. Double-click: opens the first file in the folder. The Favorite Folders panel’s menu (the “gear” icon at the head of the panel), Add current folder to favorites adds the current panel to the list of favorites. Panel menu: Clear favorites list (see above) clears the entire list. 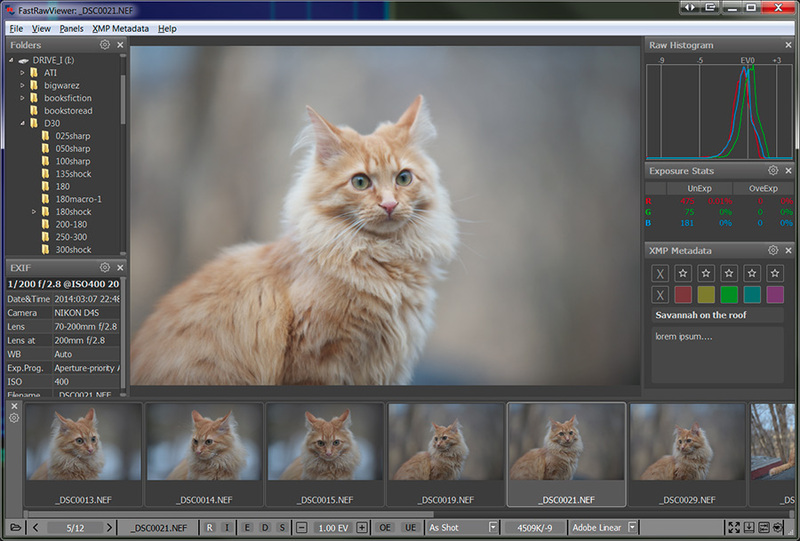 FastRawViewer background process scans files and receives system signals upon folder updates. This prevents safe ejecting of removable media, including flash memory cards and cameras connected to the computer via a cable. All background processes are stopped as fast as possible. The monitoring of the current folder is cancelled. The current file display is cancelled. The current / working folder is changed to %HOME%/Pictures, or, if that one is not present, to %HOME%. Upon the completion of the Close File command the removable media can be safely un-mounted and ejected, as usual. 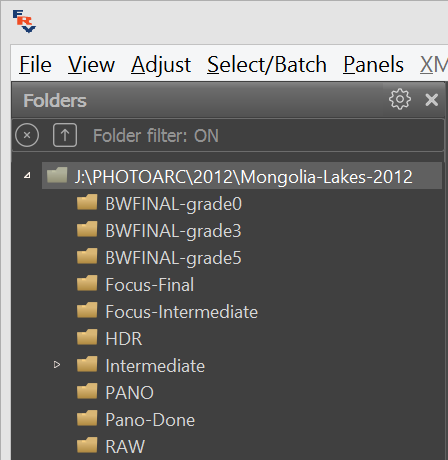 Un-mounting a portable media through the context menu in the Folder panel automatically preforms the Close File action. If a folder is currently in use by some other folder, renaming or deleting it may not be possible; in this case, an appropriate message will be displayed.